WideRange Galleries is operated by Jack Brauer; I’m a professional photographer and web developer based in southwest Colorado, though my clients live throughout the US and around the globe. 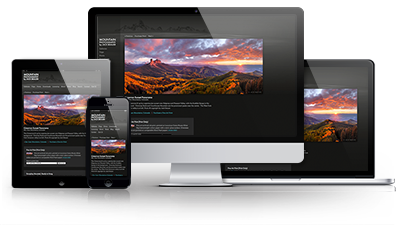 I specialize in designing and building top tier gallery websites for professional photographers. From start to finish, my software and services are tailored to the needs of photographers, developed through years of hands-on experience in the online photography industry. When you hire me to design and build your website, you are not only getting a full featured website product, but also my personal web design services and attention. My graphic design partner and I will handle the entire project for you from start to finish, from design to programming to hosting, so that you end up with exactly what you want. I am pleased to be able to provide the personal attention, service, expertise, and advice that you just can’t get with the big box companies. Check out my clients’ testimonials to see what they have to say about working with me and my partners at WideRange Galleries! The latest WideRange Galleries websites feature mobile-friendly responsive layouts that adjust fluidly to the browser size, meaning that your content is always displayed clearly and legibly on all devices from mobile phones to tablets to large desktop monitors. Taking responsive design one step further, responsive images equip your website with the capability to serve various image sizes and resolutions automatically depending on the viewer’s monitor specs. People on mobile phones get smaller images and faster loading times, while those using high resolution retina screens and large desktop monitors will see sharper and larger images. All you need to do is upload one larger image file and the website takes care of the rest. All of the gallery website packages include a robust administration control panel (or “admin” for short), which enables you to easily manage all of the content of your website without requiring any specialized programming knowledge. Through your password protected admin panel you can set up your galleries; upload your photos; designate your print sizes, options, and prices; add miscellaneous pages; and so much more. See a full list of admin features here. WideRange Galleries websites provide a solid SEO foundation, while the admin control panel gives you all the tools you need to optimize your pages’ keywords and content for search engine performance. Based on your input and desires, my graphic design partner will create custom graphics for your website design that will visually support your photography style, rather than distract from it. As a creative professional, having a unique custom website design shows that you care about your art, and sets you apart from the masses of photographers who use cookie-cutter plug-and-play gallery websites. We will work with you to create a website that looks and functions exactly as you wish, to show off your photography as it deserves to be presented. If you already know a great graphic designer, or if you’d prefer to create your own designs, I’d be happy to program the website based on designs provided to me, at a reduced cost. Similarly, I can also convert your existing website design to the WideRange Galleries software. Purchasing prints is often an impulse decision for customers, so you must enable them to make that purchase right away. WideRange Galleries websites display each photo’s print purchasing options in a clear and inviting manner, making it very easy for your customers to add a print option to the onsite shopping cart and then check out with credit card using PayPal and/or Stripe payment processing. The WideRange Galleries admin panel enables you to set up a list of all your desired print sizes and display options, along with prices and shipping costs for all. When you upload your photos you can designate which sizes and options apply to each photo. The admin panel also includes records of prints sales as well as a comprehensive print sales statistics feature complete with graphs, charts, and maps which will show you which photos, sizes, and options sell the best, during which months and years, and in which locations. In addition to prints, the admin panel allows you to set up and sell almost any variety of other products or services, such as workshop listings, greeting cards, calendars, or even automatically downloadable items such as screensavers or ebooks. The first step is to figure out which website package you’d like, as explained on the Pricing page. Feel free to contact me with any questions. After emailing and/or talking with you on the phone about the details of the project, I will email you a link to a simple contract which you can sign electronically via a secure and easy online contract portal. I require the signed contract and a ½ payment deposit to schedule the project. The remaining ½ is due upon completion of the project. The payment can be sent via Paypal or credit card, or by mailing a check. If we are creating new designs for your site, we will create several “mockups”, or initial design ideas, in Photoshop. These are basically pictures of how the website would look. The first round of mockups could be considered rough drafts, and based on your feedback we will change and refine those designs. The more feedback you provide, the more info we have to create a design that you will be happy with. This process repeats until we’ve nailed down the design. At this point, I will start programming and cannot go back and make major design changes. At the same time that I’m working on the website, I will install your admin program so that you can start creating your gallery structure and uploading your photos. Once I’m done programming the website and you’ve reviewed it, I will launch it live whenever you’re ready. The whole process usually takes about a month, but a lot depends on how quickly you can provide feedback during the different stages of development.